For version 0.13 we will be moving away from the feature list and concentrating on eye candy. I will be making a castle, complete with normal and parallax mapping, likely windows will have specular maps. It will be in pieces, so you can build pretty much any variant you wish out of it. Junior developers can practice their skills at modeling a ruined house, well or a crate. Or perhaps a clever addition of their own. If I get bored, I might touch on the anim files. Finally I´d like to add a piece of music so that the game won´t be dead silent. I like where this is going, but I'm concerned about how "big" the castle will be in relation to the Island. I can see if this would work if the castle was somehow a part of (or built-in to) the hills (can you call them mountains?). This would give us the ability to work in dungeons which is great. I still want my undead... it would be kind of neat to re-take a castle from whatever malevolent entity is in there. I still want a village/town near the inlet with a bridge over the water. However you suggested ruins on the back-side of the mountains which is a great idea. We can use some of the open-music, like the one I used in my PoC. However... I might know a guy that can help us with background/ambient music. I'll give him a ring-a-ding. 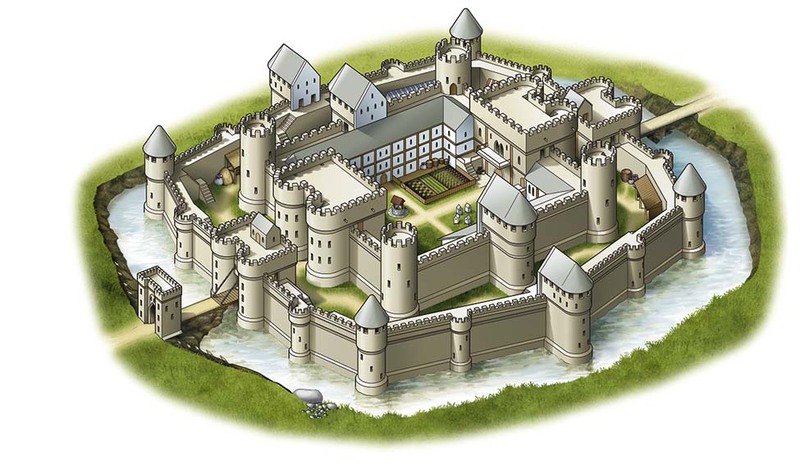 After thinking about it, the castle could be built on where the current starting location is. A lot of flat land there, much more than anywhere. I´m all for malevolent undead entities. I would make them much later though, as I might include robes/undead soldier gear as wearables for the player. In other words, this will come after the anim files have progressed along a bit. 1. Entrance, straight walls, 1 type of tower. 2. Entrance, straight walls, straight and 90 degree walls merged with towers, 2 types of towers. 3. 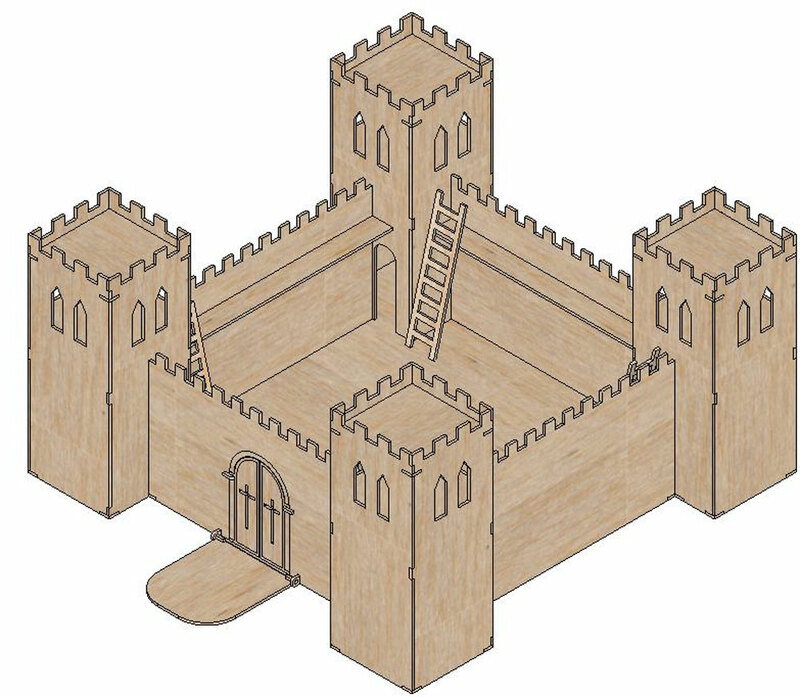 Entrance, straight walls, straight and 90 and 135 degree walls merged with towers, 3 types of towers and 2 different sized layers of castle. Doesn´t necessarily need to be in the same shape as in the images, it´s the parts that count.The more parts you´ve got, the more elaborate castles you can build. And if you´re building even a small castle, then you can build it with more variety using different parts from 3 than the same parts from 1. So there is also the chance that there would a village/town just outside the castle near where the "airport" once was? That could be reused for docks for boats. I´ve been thinking about making the Example Suite OpenMW-Template dependent again. Last time I merged multiple .omwaddons some of the information got lost and I essentially had to redo it. Having a single examplesuite.omwaddon would save us from this. The con here is that only one person at a time could edit it, but then again we don´t have a big team, nor a lot of work in OpenMW-CS itself right now. Yeah, that is a bottleneck problem... it requires someone, you in this case, merging things into the ES. OpenMW-Template and Example Suite are now separated into two different folders thanks to Damiel. I´m also thinking that we need some naming conventions for textures and meshes. As well as different folders for different types of meshes. Does anything need to happen on the Template side of things? Could you change the landscape to grass? The castle walls don´t match sand at all. Also do we bundle the next Example Suite release together with OpenMW-Template or keep them as separate downloads? DestinedToDie wrote: Could you change the landscape to grass? The castle walls don´t match sand at all. I did sand because it matched better with water/island. Do you plan on then changing all the grass textures that are near or under water to sand textures? Do we have the ability to change terrain tiles's type (texture) in the OpenMW-CS? What do you think is best? I'm OK with them being in the same release, so long as they are clearly marked as they are under different licenses. I'm also OK having the template in the ES, so that others don't have to download to files just to play with the ES, and also having the template being stand-alone.